In today’s world Bluetooth has become very popular and almost every device like mobile phone, laptop, and cars infotainment system uses Bluetooth for wireless communication. Bluetooth is not only used to transfer data but also to control another Bluetooth devices wirelessly, like using Bluetooth headset you can hear the song wirelessly from your mobile phone or can use car audio system to play the songs from your mobile. Bluetooth is a wireless technology that works on the frequency of 2.4GHz. Normal Bluetooth signal is in range of 10 meter radius. Bluetooth is most commonly used wireless technology in embedded projects provided that the range of communication is limited. Bluetooth has added advantage of its low power consumption and low cost operation. It is generally used for interfacing microcontrollers with Smart Phones by using Bluetooth applications. We have seen interfacing of Bluetooth module with other microcontrollers like Arduino, 8051, PIC etc. 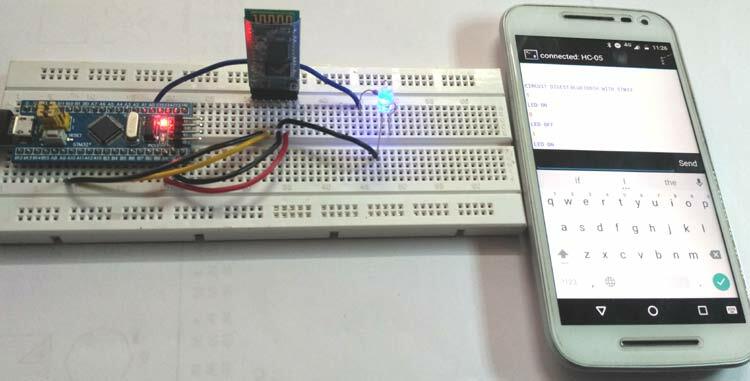 Now in this tutorial we will interface a HC-05 Bluetooth module with STM32F103C8 and Turn ON/OFF a LED using Android mobile. It is mostly used Bluetooth module in embedded projects. It is a serial Bluetooth module that uses serial communication having range less than 100m and operates at 5V (3.3V minimum). It can be used to connect two microcontrollers wirelessly and also with mobile phone and laptops. As there are many android applications are available, it is very useful for making wireless Bluetooth controlled projects. It uses USART communication and can be interfaced with microcontrollers having USART communication protocol. It has an integrated antenna. It has Master/Slave configurations that can be changed in AT command mode that is useful when only one device should send the data (master to slave) like for example from PC (MASTER) to slave (any MCU). A master can connect to other devices and slave doesn’t connect to other connection other than master. It has two modes AT Command Mode & Data Mode. When Bluetooth is powered up it enters data mode default. This mode can be used for data transfers. To enter into AT Command mode during power up we need to press the button present in module to change the default settings of the module like master/slave configurations. EN pin (ENABLE) -This pin is used to set Data Mode or AT Command Mode. By default it is in DATA MODE. When button pressed during power up it goes to AT command mode. It has a LED (RED) indicator which provides the state of the Bluetooth module. When the Bluetooth module is NOT CONNECTED to any device the signal goes low and red led blinks continuously which indicate module is NOT PAIRED. When Bluetooth module is CONNECTED to any device the signal goes HIGH and red led blinks with some delay which indicates module is PAIRED. STM32F103C8 (BLUE PILL) USART serial communication ports are shown in the pin out image below. These are blue coloured having (PA9-TX1, PA10- RX1, PA2-TX2, PA3- RX2, PB10-TX3, PB11- RX3). It has three such communication channels. The TX pin (PA9) of the STM32F103C8 is connected to the RX pin of the Bluetooth module. The RX pin (PA10) of the STM32F103C8 is connected to the TX pin of the Bluetooth module. VCC (+5V) pin of Bluetooth module is connected to 5V pin of STM32F103C8. GND pin of Bluetooth module is connected to GND pin of STM32F103C8. The (PA0) pin of STM32 (Blue Pill) is connected to positive pin of LED through a series resistor. The LED is used here is mixed colour. The led another pin is connected to GND of STM32. Interfacing Bluetooth with STM32 is same as arduino and programming in STM32 is same as Arduino IDE. See this tutorial for programming STM32 with USB using Arduino IDE. As already told, in this project, we will interface a (HC-05) Bluetooth module with STM32F103C8 and use a Android Smart Phone with Bluetooth Terminal android application to turn ON and OFF the LED. Note: The RX & TX pin must be removed while uploading the code to STM32F103C8. Complete code for this project is given at the end of this tutorial with a demonstration Video. Coding for this project is so simple. Same Arduino codes can be used but only the pin should be changed. Because we have three sets of USART pin in STM32F103C8 so we must specify the correct pin that we used to connect the Bluetooth module. We used Serial1 here because we connected HC-05 to TX1 and RX1 of STM32. We can also use Serial2 or Serial3 but accordingly pin must be connected. Here we use if statement because these code only executes when Serial1 port has any data received from the Bluetooth module that why this statement is used Serial1.available() > 0 . Otherwise if it won’t get into, it waits until it starts serial communication. Now it stores the received data in a variable inputdata = Serial1.read(). Then it check the value sent from Bluetooth terminal app. So if value is 1, it prints LED ON and makes the pin (PA0) go HIGH by statement digitalWrite(pinout,HIGH) and if the value is 0, it prints LED OFF and makes (PA0) pin go LOW. Step 4:- After connecting with HC-05 Bluetooth Module, provide values in the terminal 1 or 0 to turn ON and OFF the LED. You will also receive a message that LED is On or Off.